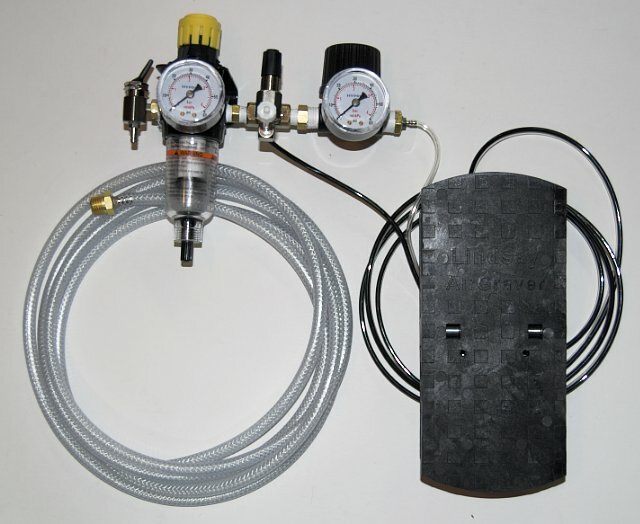 The benefit of dual regulators is that a user can adjust the pressure to the tool if desired without needing to readjust the idle. Use pneumatic dentist-type drills and rotary hand pieces with an impact AirGraver handpiece by adding this foot control to an AirGraver controller. May be used with either the AirGraver FootControl or PalmControl with an air compressor. I asked Steve Lindsay to send me an AirGraver and as soon as I got it up and going, I knew why people where impressed, with in minutes my cutting improved, simply because the AirGraver gives you more control. I am really happy with it and I would recommend anybody who is still using other equipment to give the AirGraver an honest try, you will probably have the same experience I did.